On D-day an estimated 2,500 Allied soldiers died. I was 24 years old, the acting platoon leader for the 2nd Ranger Battalion, D Company. We were charged with one of the most dangerous missions that day, and we had been training for it since April. After we landed on the beach of Pointe du Hoc, which was between Omaha and Utah beaches, we were supposed to climb the 100-foot-high cliffs and take out the German cannons we believed were stationed there. The guns had a 10- to 12-mile range and were a danger to the forces landing at Utah and Omaha. There were 22 people in my particular LCA (landing craft, artillery). We were under fire as we neared the beach. When the ramp of the LCA went down, I was the first one to step out. As I was getting off, I was shot in my side, but the bullet only went through muscleit didn't hit any jointsso I was able to keep going. When you're a leader, you've got to see to it that everything gets done. As long as you can stand up, you keep going. After getting shot, I stepped off the ramp and thought the water would be ankle deep, but I stepped into a shell crater, so I went down holding all my gear and was completely underwater. The other guys pulled me up, and we started our assault of the cliffs. We fired hooks, with ropes attached, onto the cliffs, and we set about climbing the ropes. The Germans were firing down on us, sending mortars, and they were cutting the ropes. When we reached the top of the cliffs, we had to fight through the Germans and locate the huge guns. But they weren't there. They had been moved. We had to keep searching for them. The Germans were hiding in underground tunnels. Every time you turned around, one would pop up. I found the guns about a mile away in an apple orchard and rendered them inoperable by smashing them. I wasn't really scared. I was the platoon leader and had an awful lot on my mind. I had no time to think of myself. We had a very difficult mission, and we were thinking of how we were going to cope, and we did a very fine job. 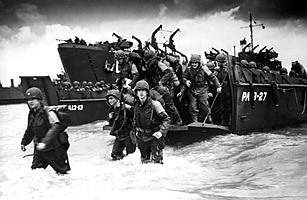 All told, 150,000 Allied soldiers came ashore that day. But it had its cost. I landed with 225 other Rangers, and only 90 were left standing at the end of the battle. Lomell, a retired lawyer, lives in Toms River, N.J.